Andrew Liveris, the CEO of Dow Chemical, said yesterday that he planned to repay Berkshire Hathaway the $3 billion Dow received in 2009 to help fund its acquisition of Rohm & Haas. Berkshire’s investment in Dow is in a 8.5% convertible preferred stock that has resulted in Berkshire receiving $255 million in dividends annually. The preferred stock is convertible into 72.6 million shares of Dow at a conversion price of $41.32. Dow’s shares closed yesterday at $29.18. From this table, it can be seen that Berkshire’s largest investments in Wells Fargo were in 2007 ($2,866 million), 2005 ($1,183 million), and 2011 ($1,168 million). Even at the peak of the financial crisis in 2008, Warren Buffett added $32 million to his position in Wells Fargo. 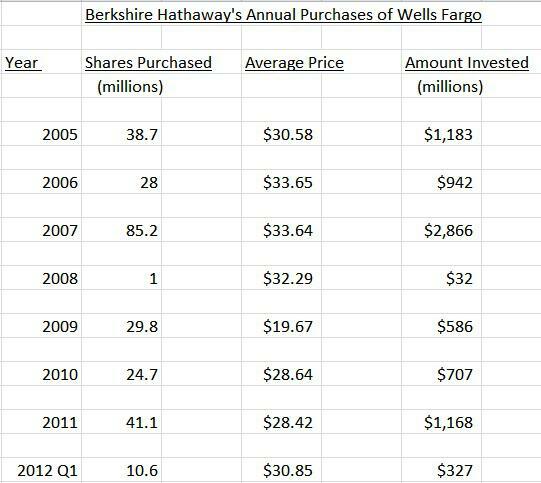 As of March 31, 2012, Berkshire Hathaway owned 7.7% of Wells Fargo and is its largest shareholder. In recent Berkshire annual meetings, Warren Buffett has praised Wells Fargo as one of his favorite investments. It is ranked number one in the U.S. banking industry in total market value ($176 billion), even though it is only fourth largest by assets. It has the most extensive bank branch network in the U.S., with 6,200 retail branches in 39 states, and serves one of every three U.S. households. Wells Fargo originates one of every four home mortgages and services more home loans than anyone else. What seems most notable of all is that this is one of a relatively few large banks that has focused almost exclusively on its original mission of commercial banking. It has not diversified into the high risk area of investment banking as so many of its major competitors have. In addition, it has avoided geographically expanding into Europe, where the banks and economies of many countries are facing enormous challenges. Indeed, 97 percent of Wells Fargo’s assets and 98 percent of its employees are based in the U.S. Wells Fargo vigorously pursues a cross-selling strategy, in which additional products are sold to its existing customers. The average Wells Fargo customer now uses six products from the bank, a substantial increase from the one or two in the 1980’s. Wells Fargo’s 2011 net income was almost $16 billion, up from $2.7 billion in 2008. In 2008, it purchased Wachovia for $15 billion, which greatly expanded its presence in the East and the South. This acquisition also resulted in a major entry into brokerage services through Wachovia’s A.G. Edwards, which enhanced its ability to cross-sell additional products. Finally, the current quality of Wells Fargo’s loan portfolio compares favorably to its competition. In the first quarter of 2012, Wells Fargo’s net charge-offs were 1.25% of its total loans, versus 1.8% at Bank of America (BAC), 2.19% at JP Morgan Chase (JPM), and 3.19% at Citigroup (C). With analysts currently projecting Wells Fargo to achieve annual growth in earnings per share exceeding 10% over the next five years, and with the shares reasonably valued at 10 times earnings, Wells Fargo is a very attractive investment with an appealing risk/reward profile.